This is just a short post of my last Monument Valley video. 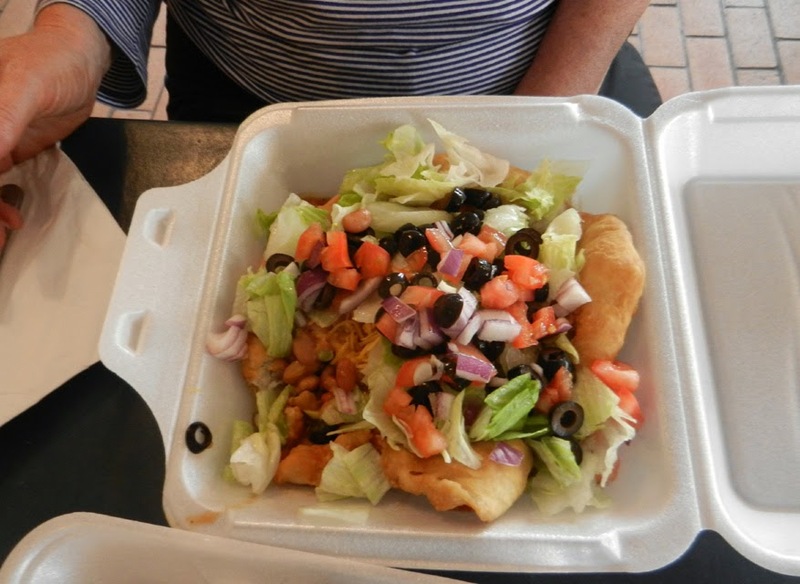 Next up is our camping and Arches National Park videos and blog posts, plus a recipe for a Frybread Taco. I'm over half way through with this Indian Summer Vacation Series. My latest video again features Don Mose, our Spirit Guide. It's only a minute and a half, but still enlightening. As you can tell from previous blog posts, I shot a lot of Don footage, and this is the last video he's featured in. 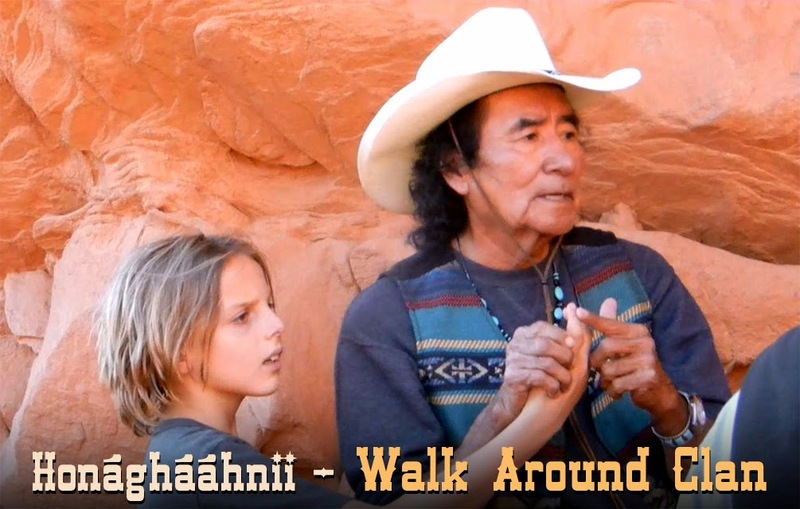 In this video he speaks of the complexity of Navajo language. I also show a list of Clan names, or what Indian Tribes call themselves. When I put the video together, I wanted to subtitle the Clan names. But it seemed impossible to write or spell them...until I Googled one of the English translated names (Tangle People) and up popped this great website. Click here to see it, but basically the Clan names are spelled out phonetically, so I could now cut-and-paste to subtitle this video. 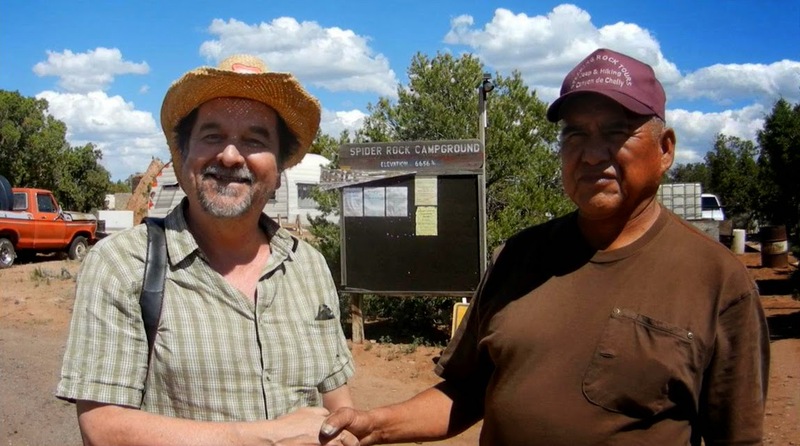 Don mentions that the Navajo language is now on Rosetta Stone - a language learning software program. You can read about the program here. 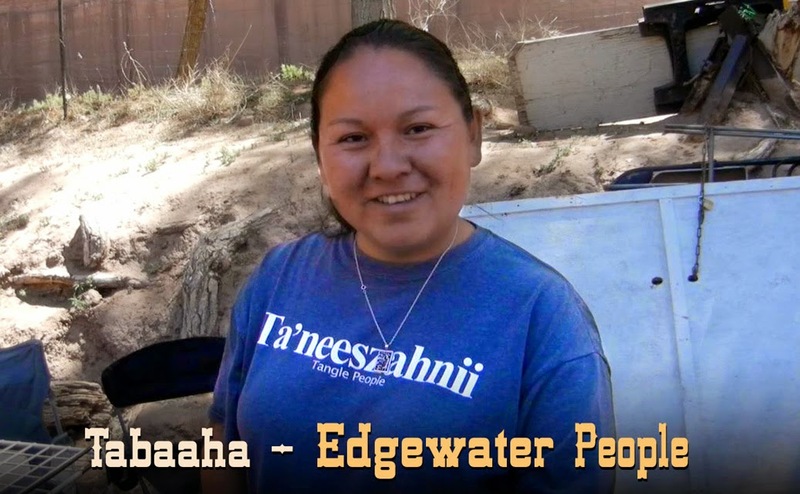 They also have a free Navajo language lesson to sample by clicking here - you do have to check a box and agree to Rosetta Stone's terms, then step though a short setup. It's all pretty intuitive, though. Well thanks for hanging with me thus far, there's still a few more videos to go. And while they may not be recipe videos, they do have food themes and humor sprinkled throughout. I try to stay in the recipe and restaurant review mold, but you know by now that I like to digress from time to time. Be sure to check back for some incredible photos and footage of Arches National Park and more wacky hijinks from The Cheap$kate Trekker. 99 thanks to Don Mose for a memorable tour. 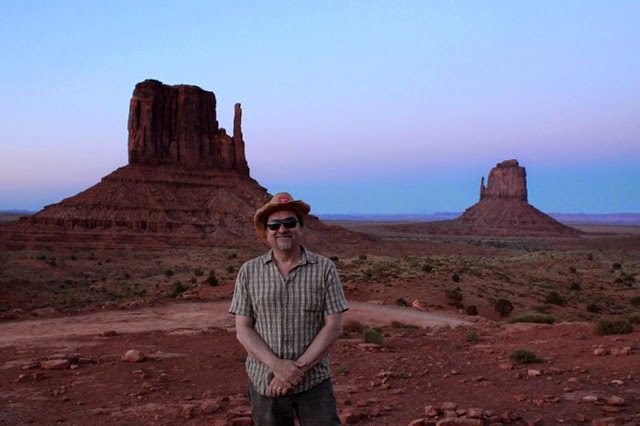 To read about getting Don Mose as a Spirit Guide in Monument Valley, click here. You can refer to me as the Naive Chef for this video blog post. 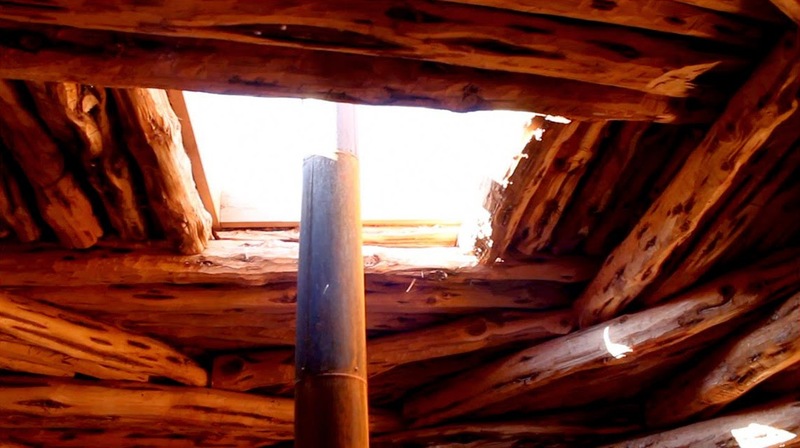 What I know about Navajo culture you could fit on the sharpened edge of a tomahawk. Any info I heard has been secondhand through popular media (movies) or the occasional radio interview. 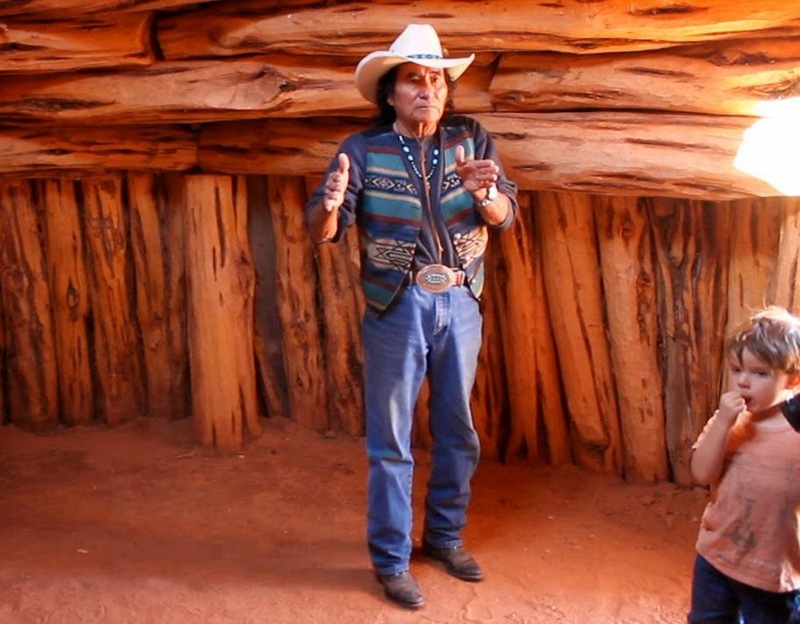 To learn directly from Don Mose, our Monument Valley Navajo Spirit Guide, was a special treat. And I got it on video for you to view at the end of this post. If you were here a couple of weeks ago then you've seen him in wise man mode. 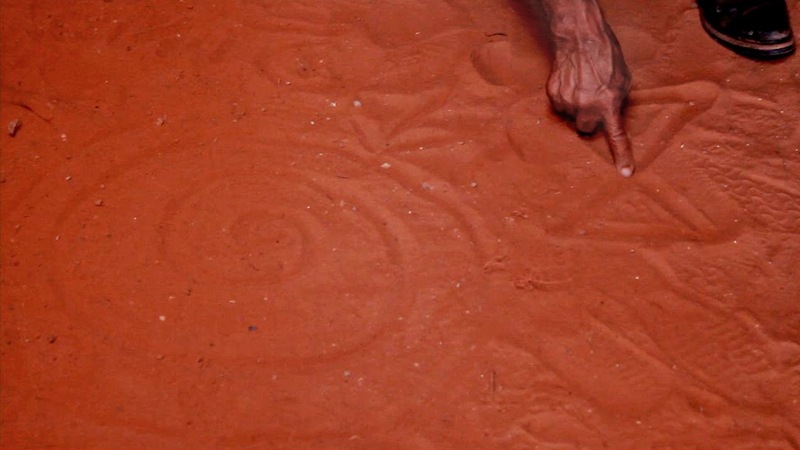 My Vision Quest Video with Don featured him pointing out amazing landscapes, deciphering petroglyphs, plus a Navajo sweat lodge ceremony lesson. Just scroll down a couple of blog posts to view, if you missed it. Male and Female Hogans serve different purposes, but I'll let Don describe that to you in the video below. 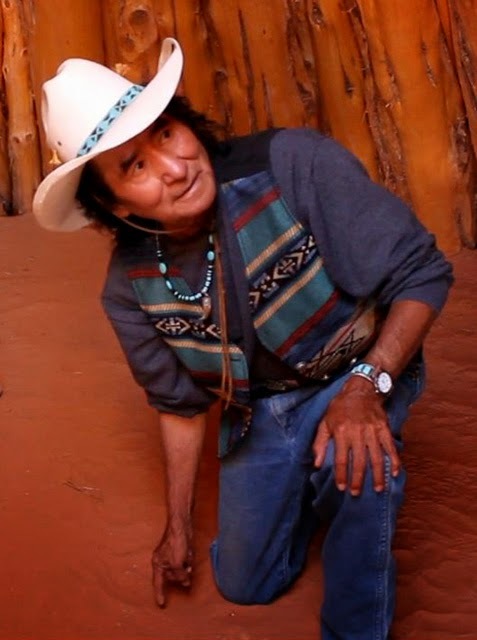 Not only was Don our Spirit Guide, he's also a Medicine Man! Allow me to be blunt, this blog post is a sure-fire hit! 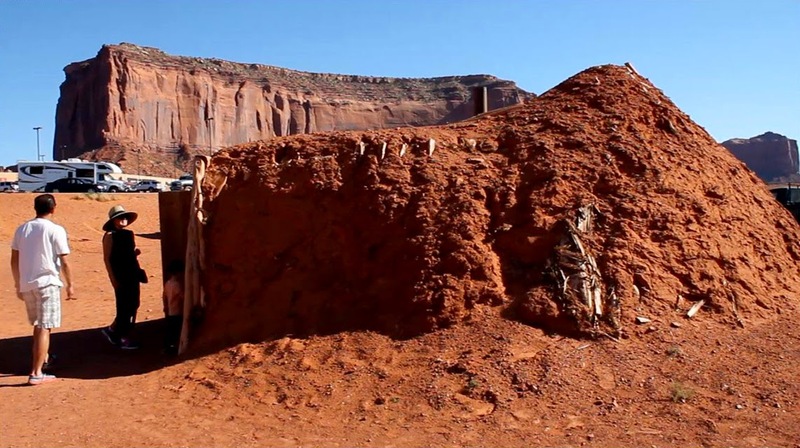 So check out my latest Indian Summer Vacation Video to learn a little more Navajo culture, plus I make a humorous appearance at the end of this video. Play it here, video runs 3 minutes, 42 seconds. 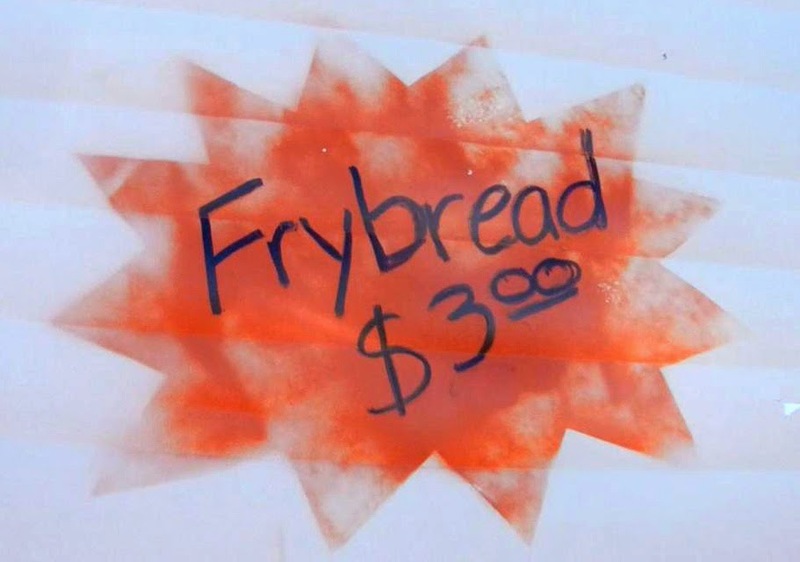 This is my forth Indian Summer Vacation video, so I think it's time for a recipe.Once we were well into Arizona, and Native American town names and symbols began to appear, I became aware of Indian Frybread at gas-stop markets and restaurants. I was eager to try it, and was not disappointed. 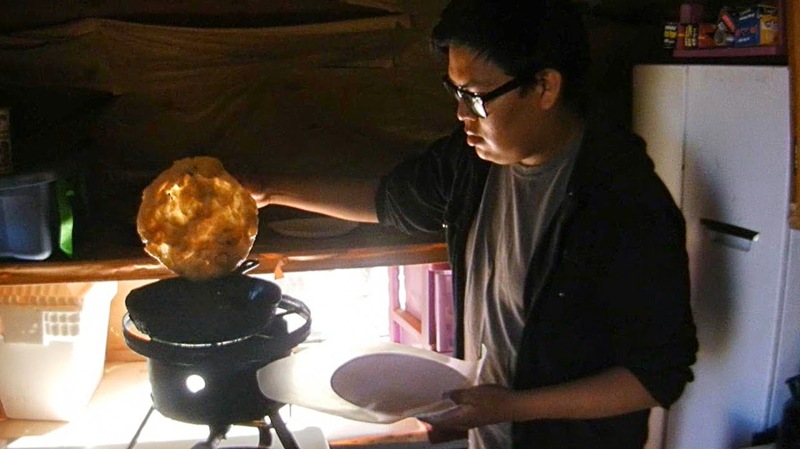 All it takes is 4 ingredients o make traditional Indian Frybread. And the ingredients are cheap but the flavor is top shelf. 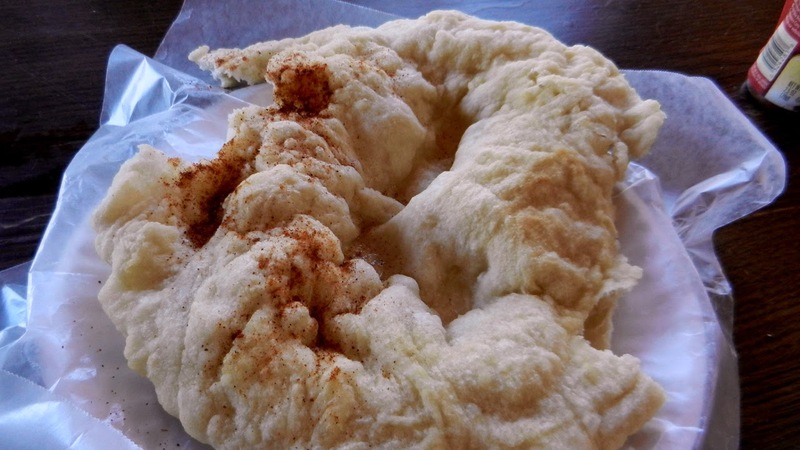 Frybread is light like a large puffy and yeasty flour funnel cake/tortilla/pancake. It's simply made with oil, flour, water and baking powder, mixed then fried in lard or coking oil. 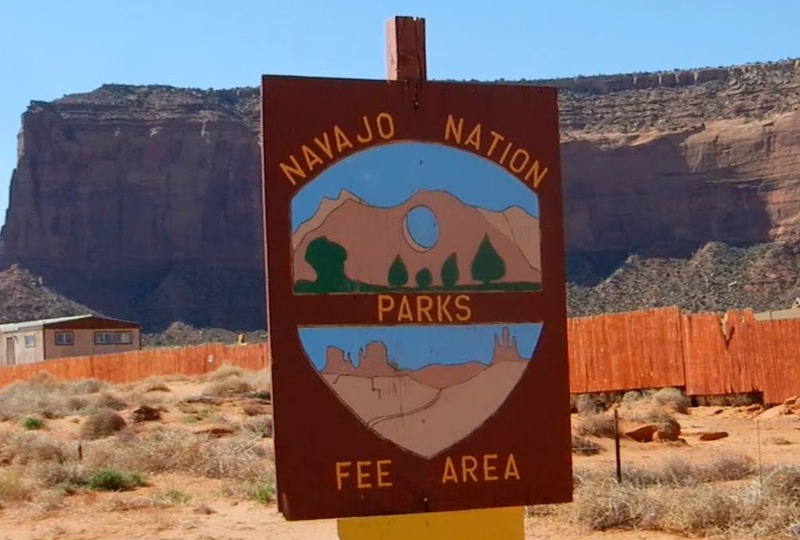 But it's a controversial addition to the Navajo Indian diet, originating when they were forced to resettle from Arizona to New Mexico over 140 years ago. They were given lard, sugar and flour by the government for the long trek, and from that arose Frybread. It has become synonymous with Indian cuisine. 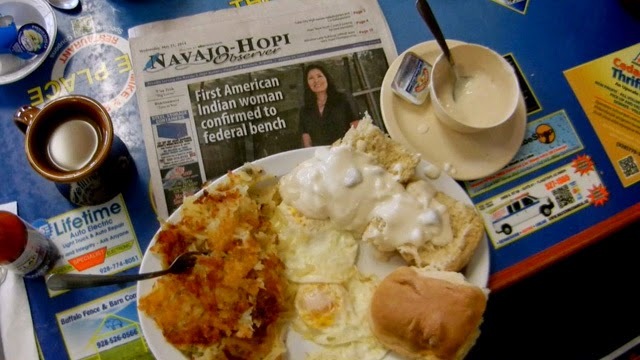 Now, we all know you shouldn't eat doughnuts every day, well Frybread carries the same baggage. You can read all about the controversy by clicking here. I don't eat doughnuts often, but when I do they go down so good. 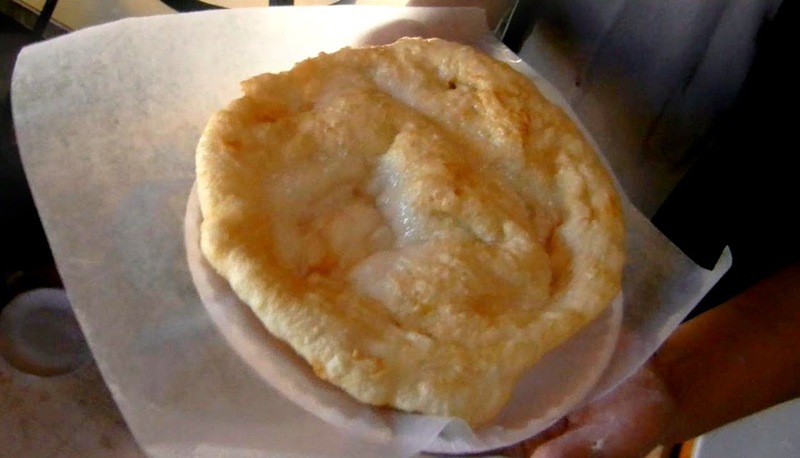 I can't advise eating Frybread routinely, but as a decadent meal, you gotta try it at least once. I had it with Chili Powder sprinkled on, and my wife had it with honey and cinnamon powder. 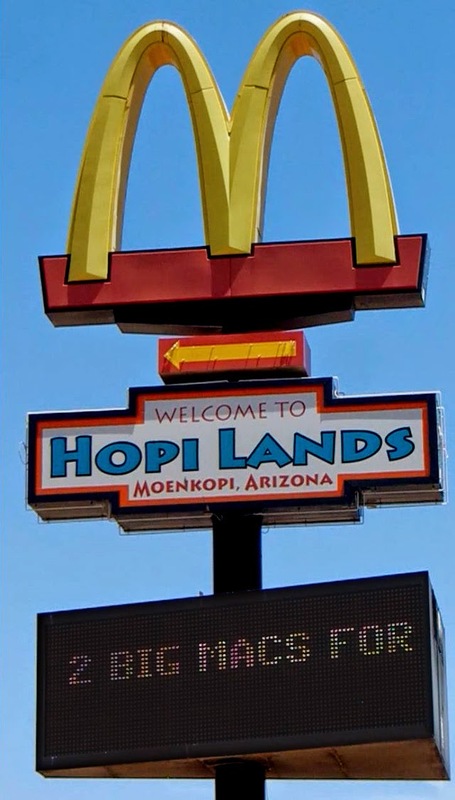 When we were touring Navajo country, we stayed in a hogan at Spider Rock Campground where we were served fresh made Frybread for breakfast, prepared by a young Indian named Lance. He said the recipe came from his grandmother. 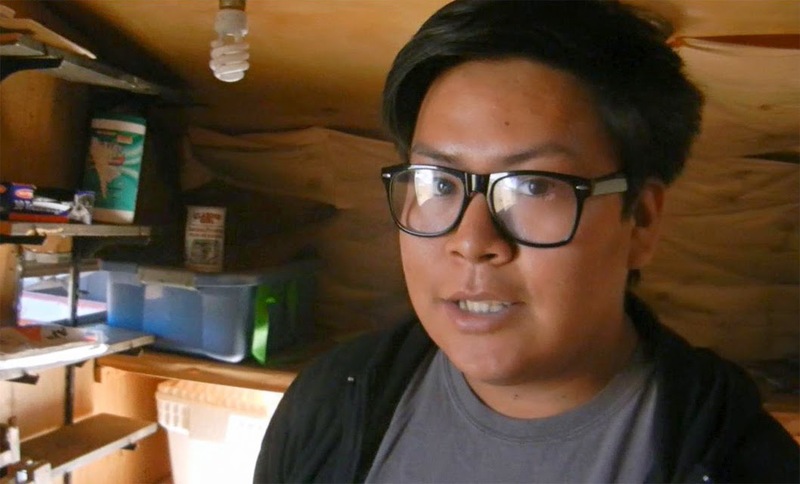 I got Lance on video making Frybread, so you get the recipe firsthand. I shot Lance on the last day of our vacation, so this video is out of chronological order, as I have a few more Indian Vacation posts to publish. And it was a delicious way to end our stay. 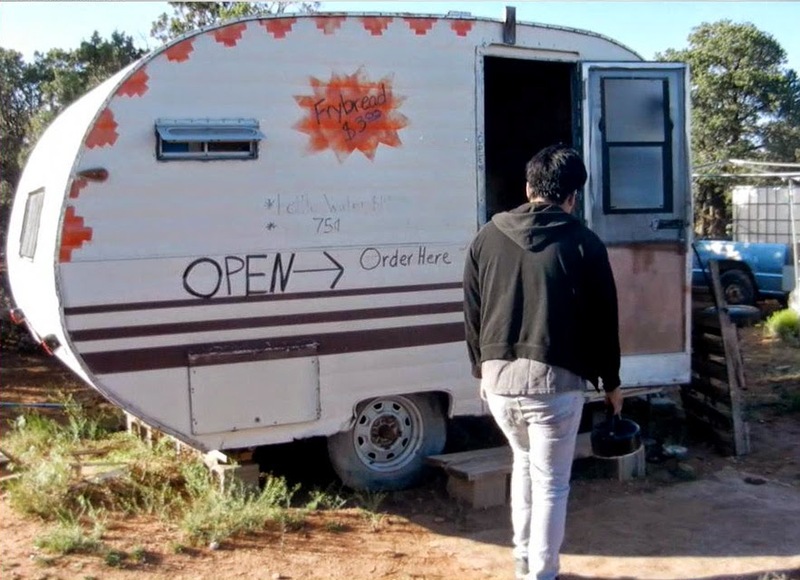 Here's the Frybread recipe video I made, shot in a small trailer at the Spider Rock Campground, after a tour of Canyon De Chelly in Chinle, Arizona. Play it here, video runs 5 minutes, 19 seconds. 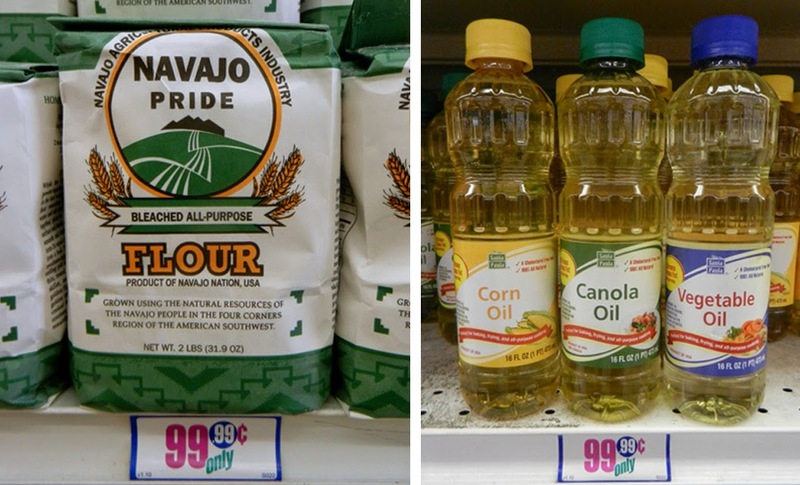 Cooking oil or shortening - enough to fill bottom of a pan about one inch deep. Add flour to a large bowl. Sprinkle in baking powder and mix well. 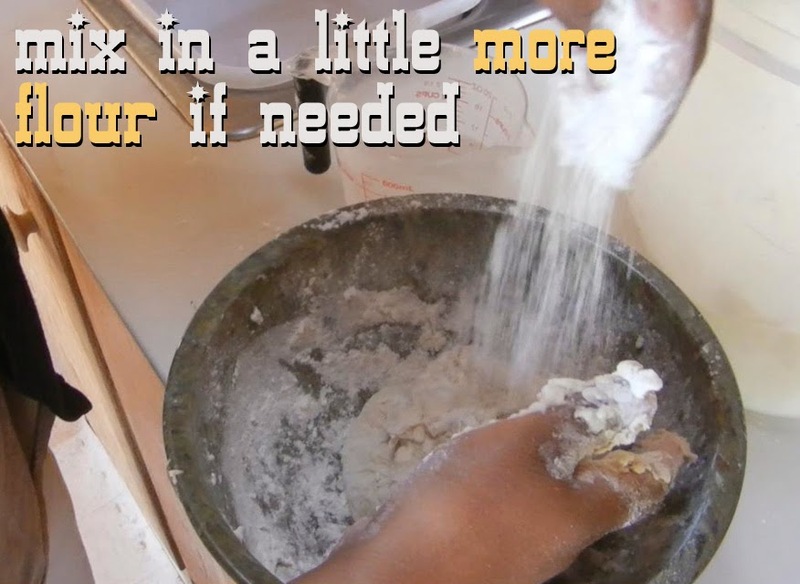 Add a little water at a time and mix into flour. 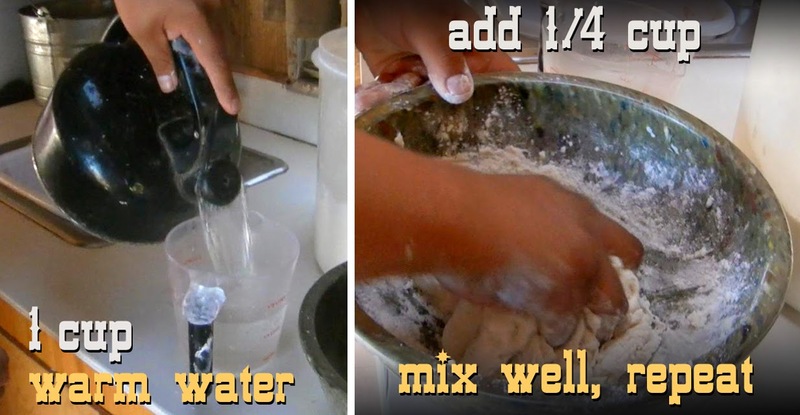 Keep adding water and mixing to form a ball of dough. Sprinkle on more flour if needed and mix into dough-ball. You want the dough to feel damp, but not sticky. 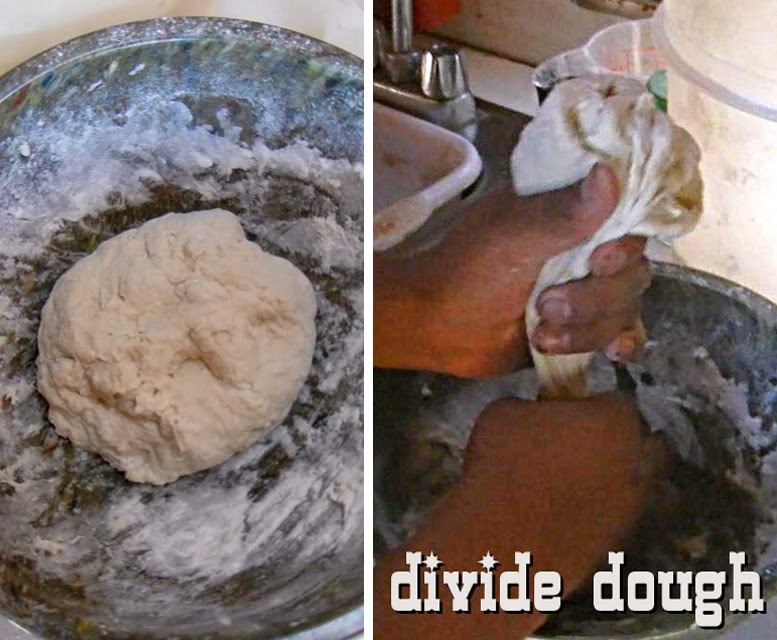 Pinch or cut dough into two rounds - these are your Frybread for cooking. This is a good time to heat up the oil in the frying pan to medium/high heat. Now you need to flatten the first dough-ball until it's like a pizza crust or large tortilla. 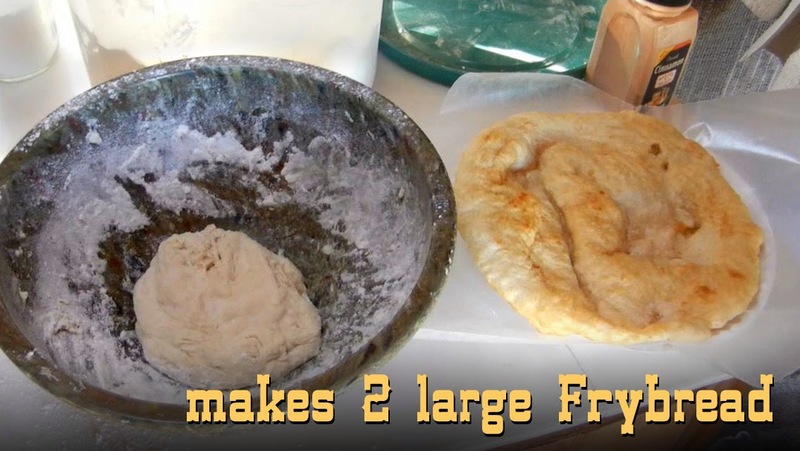 You can use a rolling pin, or just watch the video to see how Lance formed his Frybread rounds by hand. When dough is stretched take a small pinch of it and see if the oil is hot enough. The oil should bubble right as the dough is added. Remove the small piece of dough. 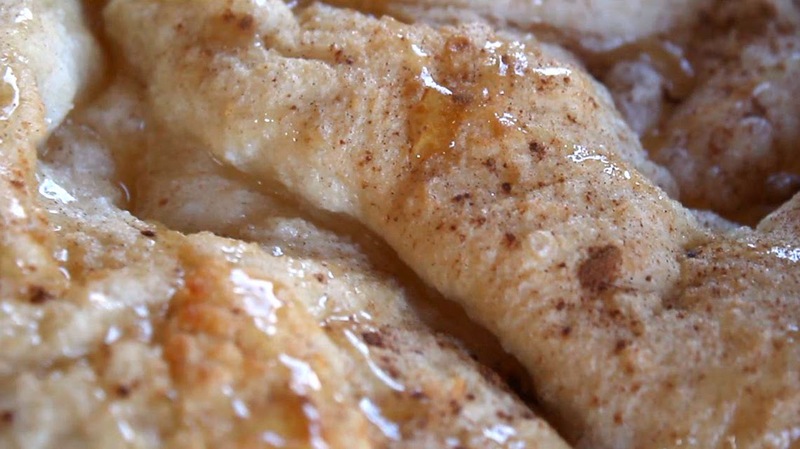 Carefully lay in the flatten Frybread into the frying pan of oil. Be careful of the hot oil. 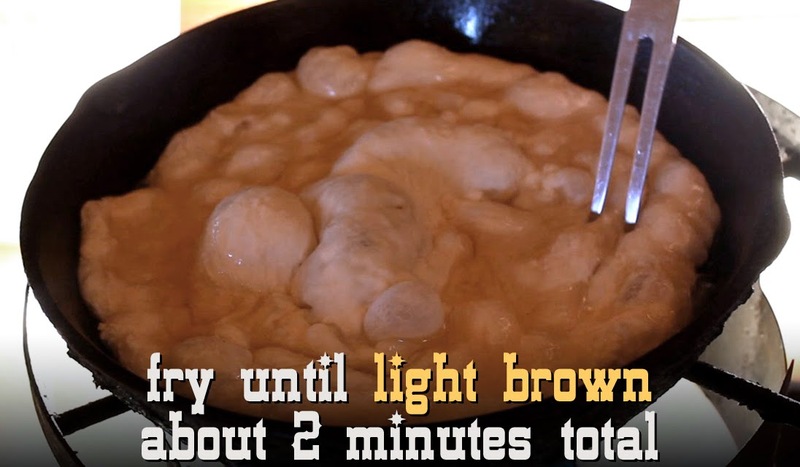 Allow the Frybread to cook about 30 seconds, then start checking it to see when it first starts to lightly brown. That's when it's ready to turn over to finish frying. Depending on the oil temperature, it will take about 2 minutes total for the Frybread to cook through. When done remove the Frybread and place on a paper towel of metal rack to drain. Repeat the stretching and frying on the other dough-ball. Lance made large bread, you could make smaller ones - maybe four instead of two Frybread. That's it. I had it with a sprinkle of chili powder. My wife had hers with some honey and cinnamon. 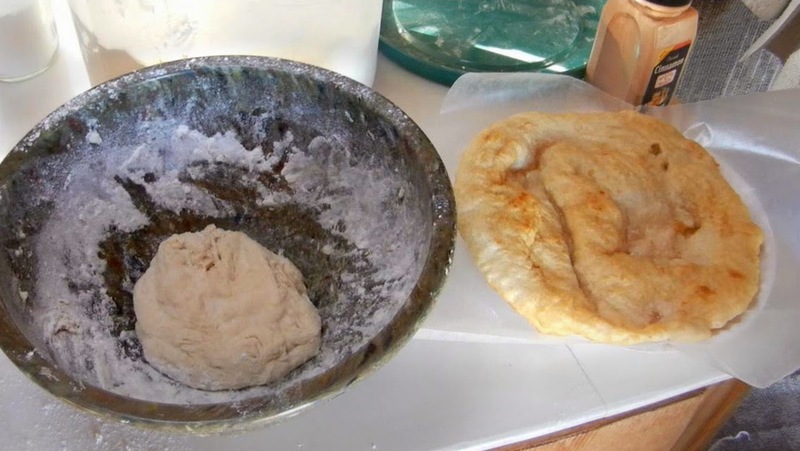 My recipe version for Frybread is a click away, here. 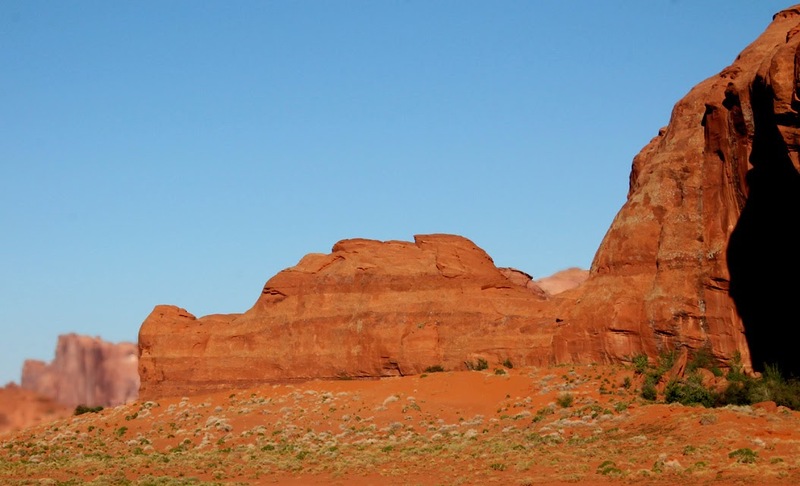 Monument Valley is one of my picks for 9 Wonders of the World -- something everyone should see. And it's in our own backyard here in the West. 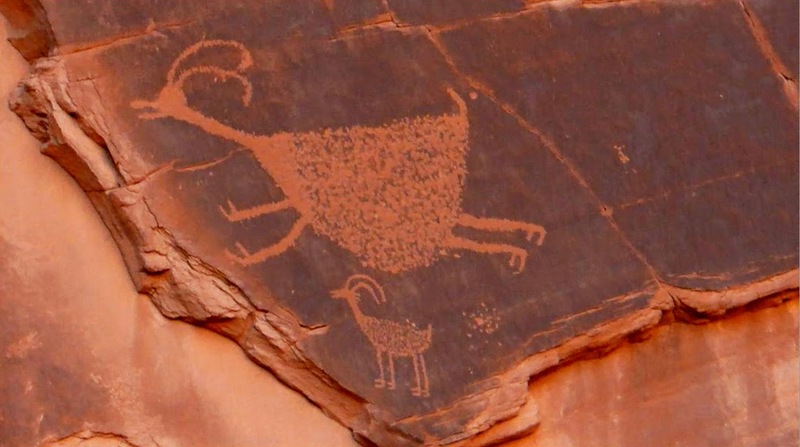 But if you can't make it to the magical Canyon Lands, then just sit back and watch the video at the end of this blog post. Allow me to be your Cheap$kate Chaperone - no admission charge necessary for this awesome tour. 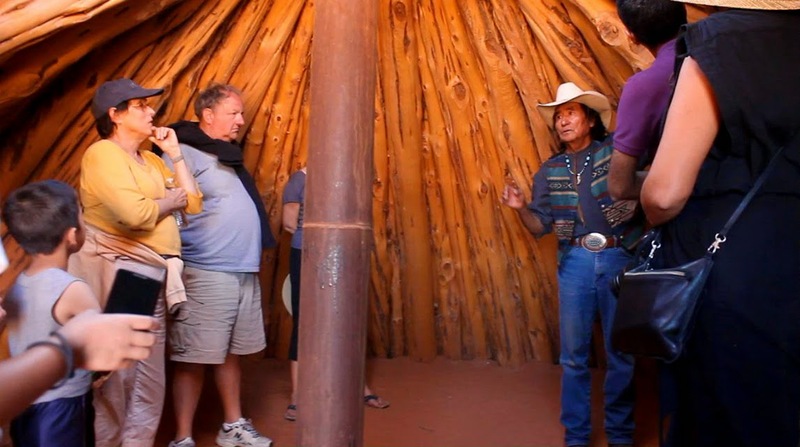 The beginning of this video starts with a Sunset Tour (5:30 - 8:30pm) of Monument Valley for $80 per person - click here to read about Navajo Spirit Tours. 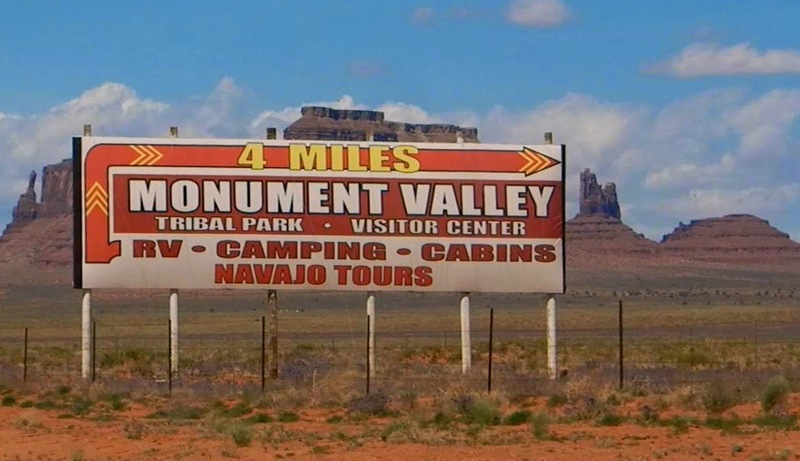 Entering Monument Valley costs $20 per car, but the ticket is good for four days. My wife arranged it all, and also found the best Navajo Spiritual Guide we could have booked. 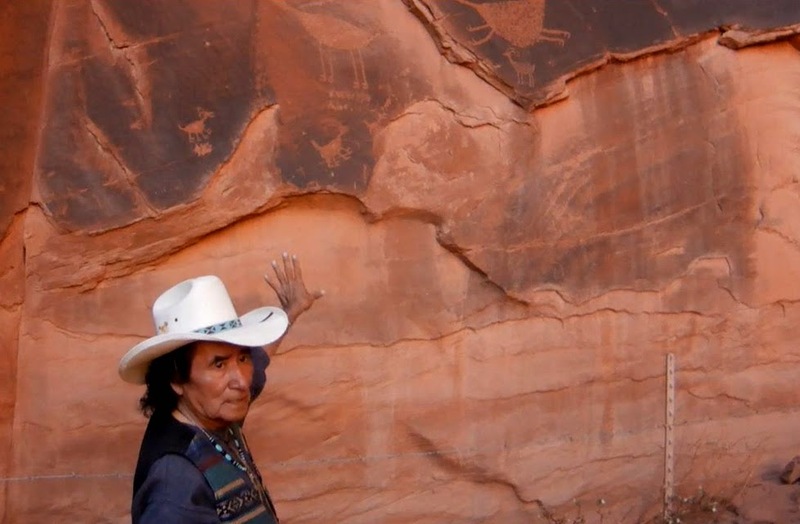 His name is Don Mose and he draws from a deep knowledge of Navajo culture. I could tell he was an experienced lecturer and teacher by his smooth and engaging delivery. He fed our heads with Indian lore and took us to the coolest landmarks, even where to stand for the best camera angle. And he fearlessly steered our tour tram over unpaved and bumpy dirt roads. At one memorable stop he even sang a melodious Indian song, cappella. You can hear it during my Vision Quest video sequence. He also has a good sense of humor - just watch him volley back any impertinent question I lobbed his way. There is too much of Don Mose to fit in this video. So if you enjoy his stories, then be sure to check back, as I will put together more of his words of wisdom in another video to share with you, including a lesson using local herbs as organic medicine, plus a tour of Male and Female Hogan living quarters -- totally fascinating. 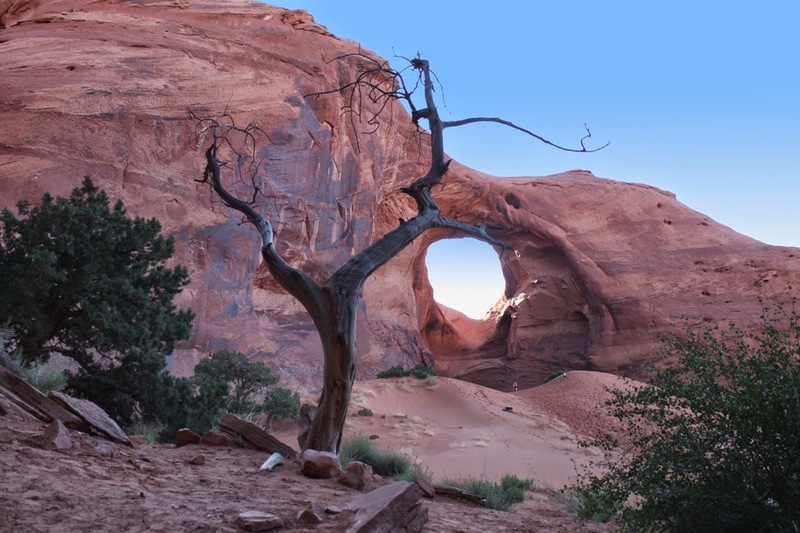 You could skip a guided tour, as you are allowed to tour Monument Valley on your own. But you'll want to read up on it so you don't just drive past the many amazing landmarks. Can you see the head of Sleeping Dragon Rock? The third video in my Indian Summer Vacation Series starts straightforward enough, with typical tourist scenes and the prerequisite 99 Cent Chef's hijinks. But by the time you're a minute past the halfway mark...well, get ready for The Vacationing Chef's outlandish Vision Quest. I knew it would be cool to make something out of our tour of a Sweat Lodge. So when I shot some video, I had no idea what to do with it. Could I have bitten off more than I could chew once again? But the next day during a lunch picnic, I found a bleached-white bone. Suddenly I had a real Vision Quest involving the bone and a talking coyote. Well, you'll have to watch the video to experience it. Dawn of Man movie still, from 2001: a space odyssey. Of course you can skip the 2001 clip and just go right to my video below and take in my Indian Vision Quest. It stands on it's own. Anyway, the opening clip to "200l: a space odyssey" is a click away here. My latest Indian Summer Vacation video has it all: breathtaking photography, skillfully told Navajo knowledge, a hallucinatory Vision Quest and a bit of comedy. And check back as there's a lot to come - I haven't even got to awe-inspiring Arches National Park, or a delish Frybread Taco Recipe. Play it here, video runs 7 minutes, 37 seconds. Sometimes the journey is as interesting as the destination. Come along on the road to Monument Valley for a cheap$kate junket in my latest Indian Summer Vacation Video. I'll be riffing on Hollywood cowboy John Wayne and stirring up the pot about the Washington Redskins football name controversy. Plus, you'll get Cheap$kate Tips and a fun point-of-view travelogue experience filmed in majestic Chefscope! I had the presence of mind to ask the burger-joint manager if I should fill up my gas tank here, or continue driving into Arizona for gasoline. He said: My wife always points me to the border, since it's only 5 minutes away, for gas that's 50 cents cheaper than here in California. Okay....that's your first Cheap$kate Tip. 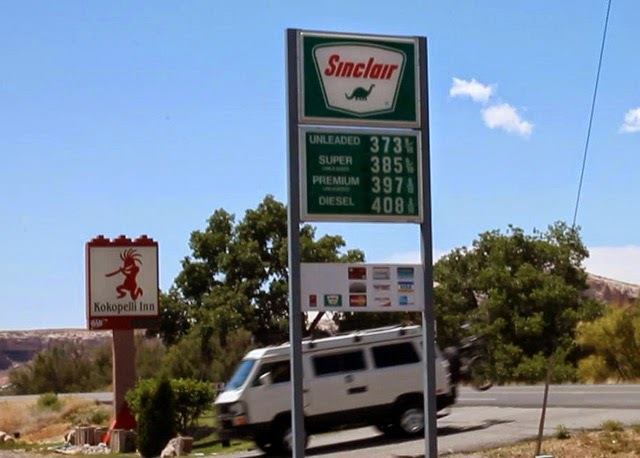 Most unleaded prices were from $3.50 to $3.60 per gallon. The above prices are on the high-end for Arizona. We continued on. Once we were a few hours into Nevada, heading to Flagstaff for our first overnight stay, we began to see signs of Indian life - towns with Native names and market/gas stations selling Frybread and cool trucker hats and t-shirts. It was hot and dry the whole way, so make sure your car air-conditioner is working. My wife and I were tempted to stop many times for roadside stands selling Indian jewelry and other items, but figured there would be plenty of opportunities further down the road. But the most difficult sights to pass were the frequent highway landscape viewpoints, although I managed to camera-grab as much as I could through the driver or passenger windows, as you will see in my video at the end of this post. Although there were miles of barren road, we always managed to find convenient places to stretch and fill up. At the end of our first travel day we spent the night in a cheap motel on the edge of town in Flagstaff, Arizona. We stopped for breakfast the next morning at a boisterous Route 66 diner called Mike & Ronda's The Place (click here for Yelp reviews and the address.) Nothing fancy, just huge plates of food priced reasonably. I had a tasty breakfast of two eggs, hash browns with two giant biscuits smothered in gravy for the incredible cheap price of five dollars! Whew, I managed to finish it, but just barely. I recorded it for posterity and it's in the video - seeing is believing! Breakfast in Flagstaff, Arizona at Mike & Ronda's The Place. After a couple of hours on the road, the earth soon turned deep red from the erosion of sandstone. 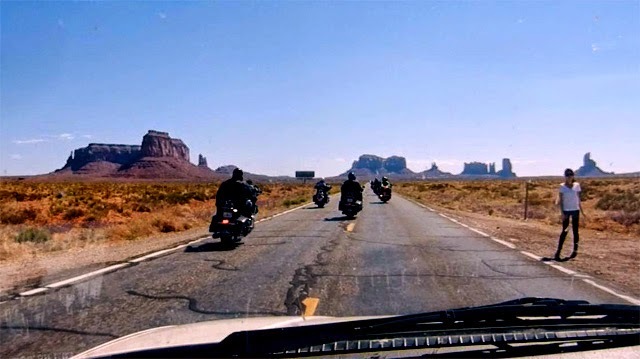 Iconic western movie vistas began to appear around turns and topping hills. 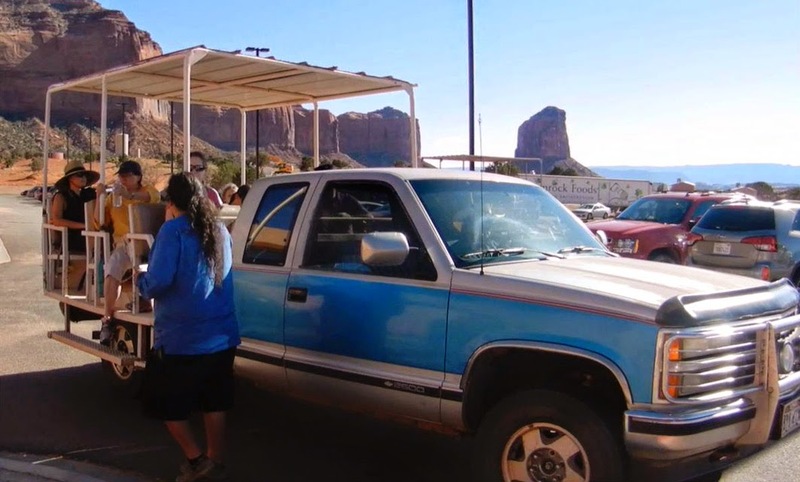 Pulling over one last time into a gas station/market, before we crossed into Utah and onto the Indian reservation surrounding Monument Valley, I noticed the cold cases lacked beer and wine. 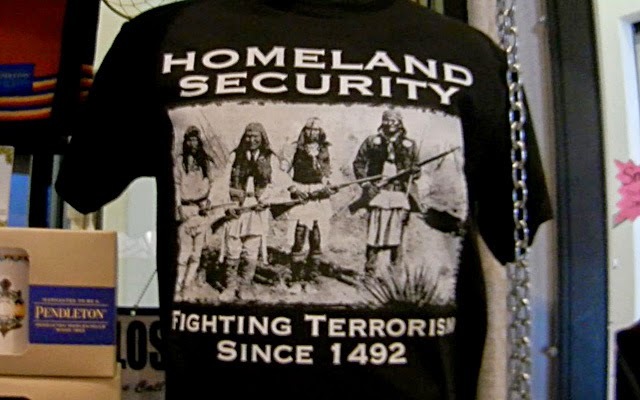 I soon found out why, or at least the law - no alcohol sold or allowed on Indian Reservations. I had a cooler with a couple of 24 ouncers and my wife had box wine. I figured as long as we keep it low key and out of sight we would not have any problems. So this is another tip for you, be cool and don't flaunt it - be respectful of local customs and laws. 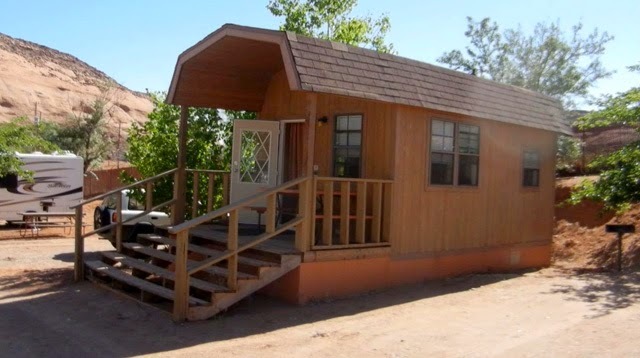 We arrived in Monument Valley around noon and checked into Goulding's Lodge and Campground (click here to see all they have to offer.). There is a large gift shop were you check in and just down the road is a well-stocked grocery store. 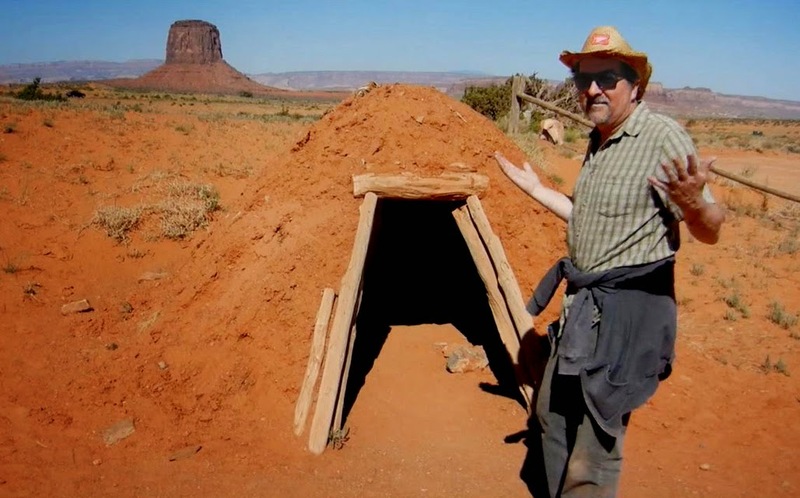 Plus there was a screening room that was showing, later that night, John Ford's "She Wore a Yellow Ribbon" with, of course, John Wayne, and shot on location in Monument Valley. I'll never watch an old Western movie the same way again after this trip. Check out the movie trailer below. It was a pleasant stay at Goulding's Lodge, about $92 dollars a night for a nice cabin. There would have been enough room for at least five. Along with a double bed, there were bunk beds and a loft space with one more mattress. Again check out my video to see what it looks like inside. 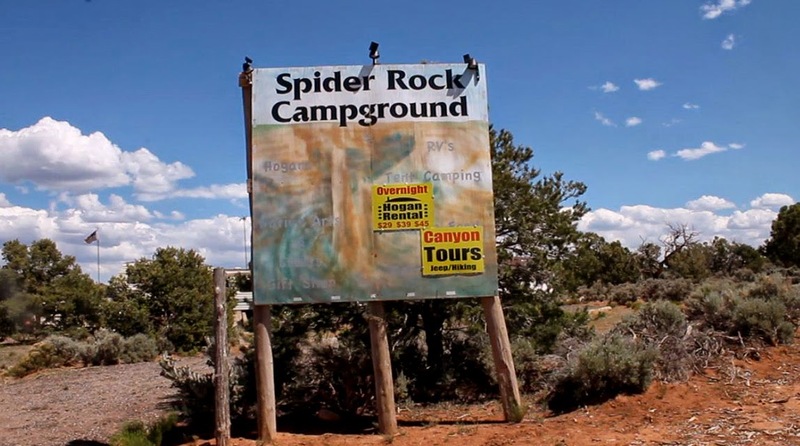 There are slots for RV's and grounds for tent camping, too. This would be our last night for the rest of the week with a comfy bed. For the next few nights we'll be in a tent or Navajo Hogan. You'll soon see what I mean in later blog posts. We had enough time to unpack and eat a quick deli meal before heading out on our Monument Valley tour at 3pm. Well, you'll have to come back to see that part, and believe me, it's a doozy of a video - probably the wildest one I've made yet! So hit the play button below and take a front seat ride with the Cheap$kate Excursionist, and it won't cost you a cent. Play it here, video runs 3 minutes, 20 seconds. 99 thanks to Amy for all the hard work planning and reserving hotels and camping slots for us, and everyone that put up with me waving my camera in their faces! Special gratitude to Mike & Ronda's The Place and Goulding's Lodge and Campground.